The Colorado River flows again! 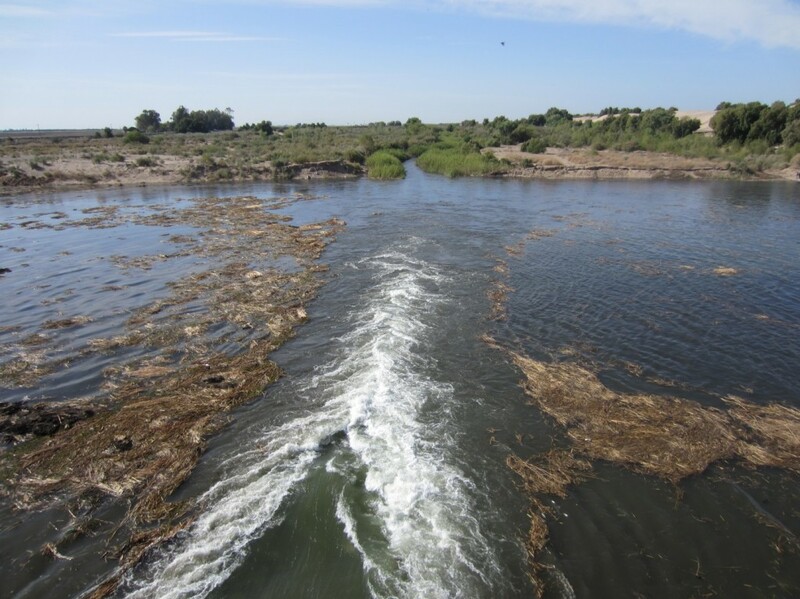 Last Sunday – the day after World Water Day – I joined more than 200 people in an impromptu celebration at Morelos Dam, welcoming the return of water to the desiccated Colorado River delta. We came from all over – from Albuquerque and Boulder and Ciudad Juarez and Ensenada and Vermont and even Australia – to witness the historic release and to see the Colorado River flow once more. Scores of people from neighboring Algodones and surrounding homes came out as well, curious about the gathering and excited by the prospect of water flowing in the channel. The Colorado River flows through Morelos Dam into the delta. 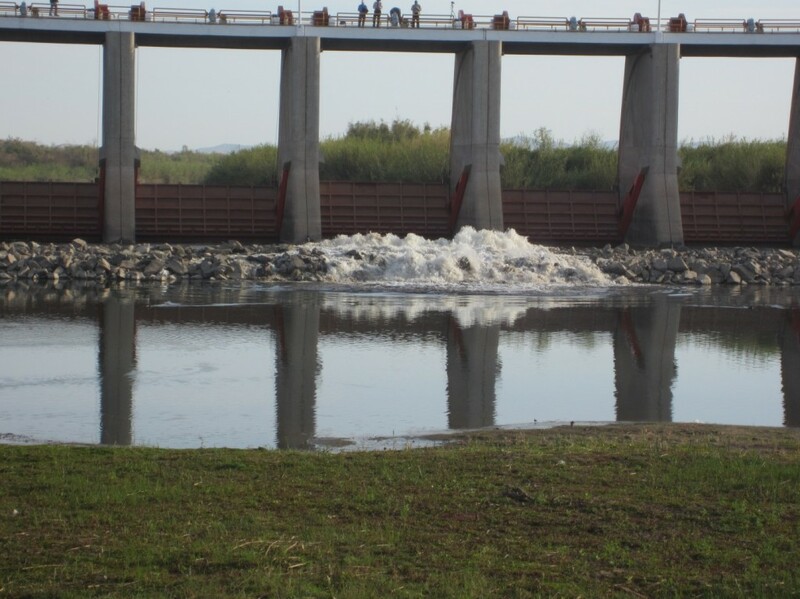 Mexican engineers opened a gate in the center of the dam shortly after 8 am, releasing 25 cubic meters per second (about 880 cfs) of Colorado River water to the delta, to a loud cheer from the crowd. The water rushed through the dam, roaring over the riprap and into the broad shallow marsh below. We watched the water rise slowly, inundating the marsh and quickly eroding the soft sediments at the top of the river channel itself. People dipped hands and feet into the rising water, then retreated as the river gradually reclaimed its banks. Below Morelos Dam after one hour of pulse flow. A few hours later a group of us drove south to see how far the river had progressed. With some expert guidance, we found the dry river channel slightly above Gadsden Bend and walked about a half mile up-channel in search of water. The channel of the Colorado River. 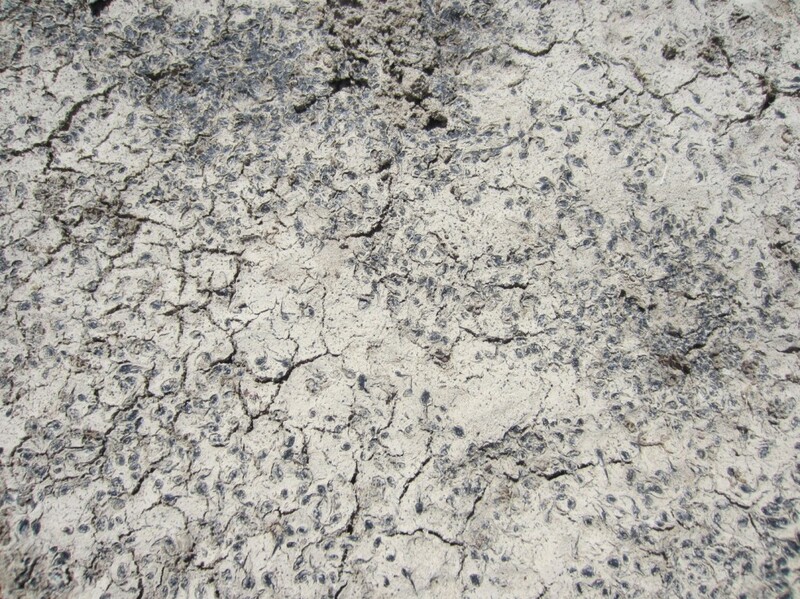 Rain earlier this year had extended the reach of the river – evidenced by high-water marks along the channel and several depressions filled with dark shapes that turned out to be desiccated tadpoles. Desiccated tadpoles in the dry river channel. 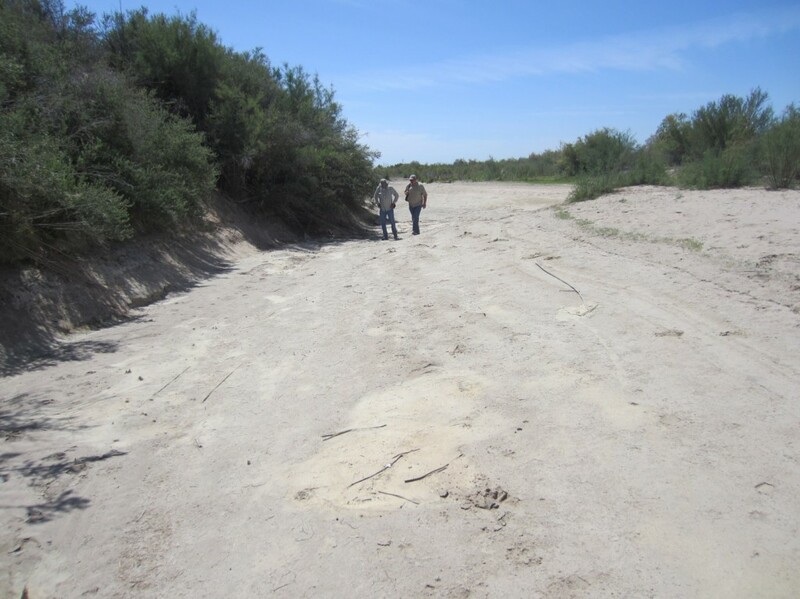 Eventually we found the farthest extent of the surface flow of the Colorado River. It wasn’t much to see, far less inspiring than the release from the dam upstream. The Colorado River flows again (ever so slowly). But the water continues to flow even as I write this, pushing downstream, rewetting the dry channel and saving some of the tadpoles lucky enough to be born in deeper pools. Cottonwood and willow seeds will germinate (by the thousands!) and we will build upon this success, for the river and for the two nations that share it. This remarkable achievement comes from years of effort, by many people on both sides of the border. Although Aldo Leopold first celebrated the delta’s Green Lagoons in A Sand County Almanac 65 years ago, it wasn’t until 1988 when Ezekiel Ezcurra and colleagues published a journal article about some isolated wetlands at the edge of the delta that the region’s potential emerged. Ed Glenn and other scientists built on this research in the 1990s, engaging the environmental community’s interest in the Colorado River delta’s amazing resilience. The Pacific Institute was one of several groups that promoted the delta’s potential in those early years, publishing Sustainable Use of Water in the Lower Colorado River Basin in late 1996, followed by two binational workshops on the delta and various other reports and policy papers. 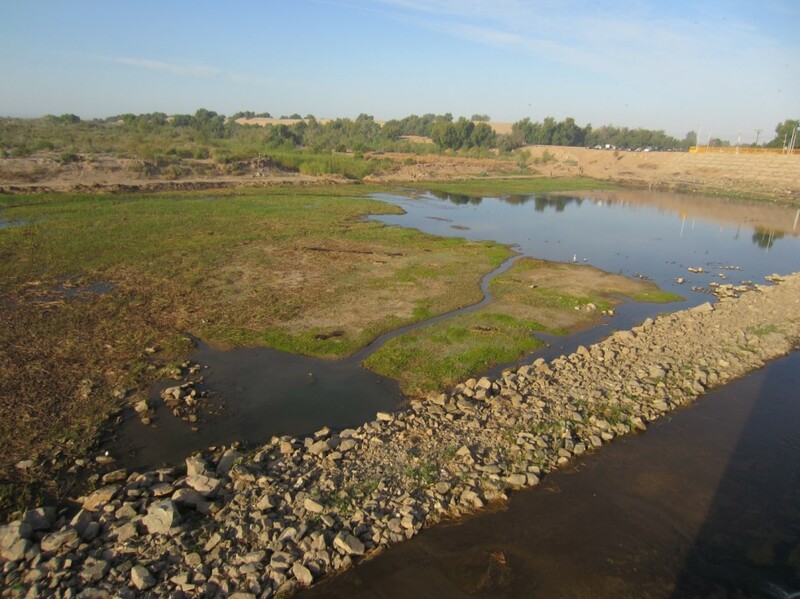 The recent High Country News article offers a good overview of the recent effort to return flows to the delta. Watching the river flow once more, celebrated by so many people who worked so hard and for so long to make it happen, restores the spirit and recharges our sense of hope and mission. Much will be written about this watershed achievement in the days and months and years to come, of vision and cooperation across multiple geographic and institutional boundaries. 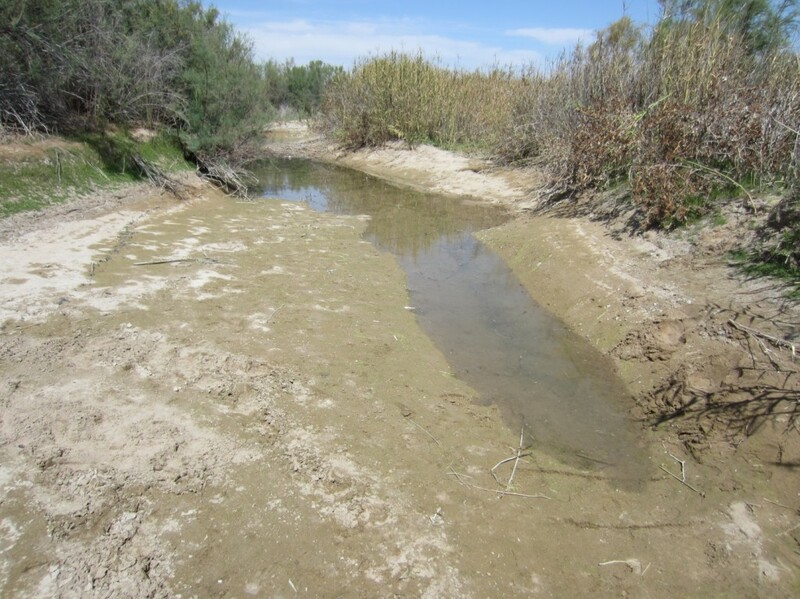 Ultimately, though, this is a story of the resilience of a river in the desert and its ability to inspire. Another good article on your blog, keep up good work!